While there are some aspects of my childhood that I wouldn't mind drifting off into extinction (pinch-rolled jeans and crimped hair? What were we thinking?) there are others that I'm happy to see revived in this millennium in a new, modern way. The latest flashback to reappear is none other than the classic fun from Skip-It. After all of those years of twirling that ball around your ankle and skipping over it as many times as possible, I love that now it is back in 2013 and totally updated in Twister Rave Skip-It. 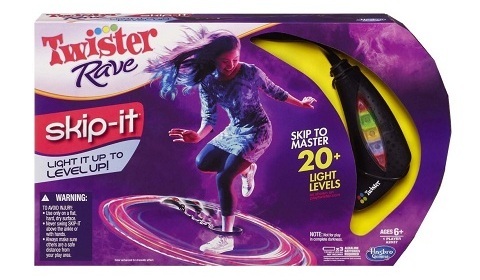 The all-new Twister Rave Skip-It game still has players skipping and jumping as long as they can, but now with the addition of the glowing Twister colors (red, blue, yellow and green). Simply put the hoop on one leg, swing the Skip-It and hop over it as it spins around — the colors glow as you skip and when all four colors glow, you've mastered it! 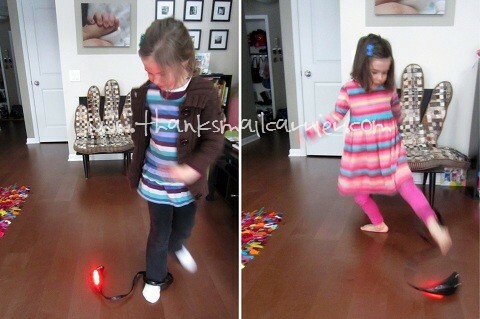 Although I've never described either of my kids as particularly coordinated, I knew that they would both have a great time trying out Twister Rave Skip-It and all of the fun it had to offer. After checking out the game and installing three AAA batteries (not included), we were ready to put our Twister Rave Skip-It skills to the test. Once we we were certain that we had a large enough area cleared of obstructions, there wasn't much else to do but place the hoop around your leg and skip! We quickly discovered three things. First, that I clearly have years of Skip-It skills built up, because I had this spinning and spinning from the first time I tried it! I rock! Second, due to my Skip-It prowess, my kids thought that doing this was going to be easy... they quickly found that wasn't the case and couldn't understand why theirs didn't magically spin for them. Third, the longer that you swing and hop over the Skip-It, the more the colorful LED lights glow — there are actually 20 different light patterns as you proceed through more and more levels! However, once you stop the game resets and you have to start over from the beginning... something that my kids seemed to find both humorous as well as aggravating. Nonetheless, we've kept on skipping and twirling since this arrived, as it's a lot of fun to see the colors light up and change as well as a great way to get in some good exercise! Twister Rave Skip-It is is designed for ages 6+ and is available now at mass merchandise retailers nationwide and on Amazon with a retail price of $19.99. 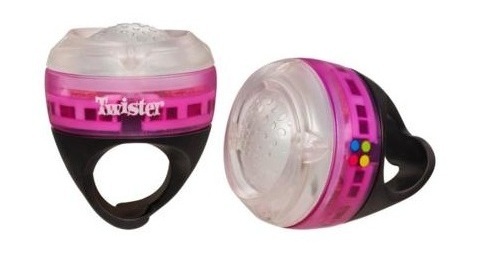 But Twister hasn't only added Skip-It to their list of Rave games in 2013, they've also introduced a new quick-action game that girls are sure to love, Twister Rave Ringz. Available in four color options (black, pink, blue and yellow), these Ringz are all about the bling. This fast-moving game challenges girls to twist, snap and clap to keep the beat to more than 20 different handclap games found online at PlayTwister.com. With each movement done while wearing the ring, it lights up and changes color for some bright and flashy fun. As these electronic Ringz come with two per pack, they're just right for pulling out and playing with a friend to see if the two of you can keep the rhythm together. 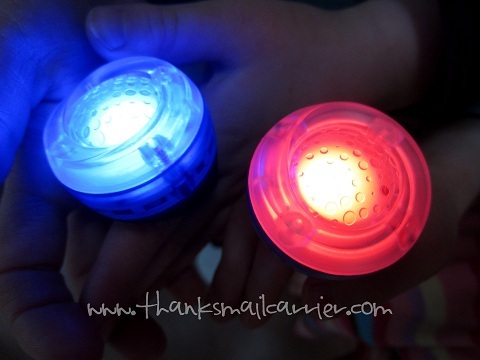 As Twister Rave Ringz are designed for ages 8 and up, I knew that Big Sister E and Little Sister B were both going to be on the young side for being able to fully appreciate them (or truly be able to partake in the handclap games correctly). 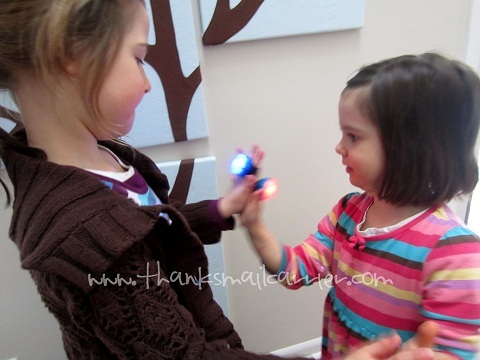 However, that hasn't stopped them from being enthralled with this new light-up jewelry and the way that they are able to entertain with every clap. Hasbro pointed out that if the players complete the handclap games in perfect sync, the Twister Rave Ringz will start and finish on the same color... although we haven't yet had an instance of being in perfect sync. But that doesn't mean that we haven't had a great time watching the online videos at PlayTwister.com to learn new skills and tricks and simply laugh about the good time that such a small game can provide. Perfect to bring along for impromptu gaming fun, Twister Rave Ringz are available now at mass merchandise retailers nationwide and on Amazon for approximately $7.99. Each ring comes preloaded with three button cell batteries, so they're ready to play right out of the package. Simply push the top to turn them on and off — they even have an automatic shutoff after a little while, just in case. As the world leader in family and adult games, Hasbro has long been committed to providing entertainment solutions for cost-conscious parents in search of family friendly activities. These two new Twister Rave games are no exception! Keep an eye out for them on your next shopping trip and connect with Hasbro and everything Game Night on Facebook and Twitter. 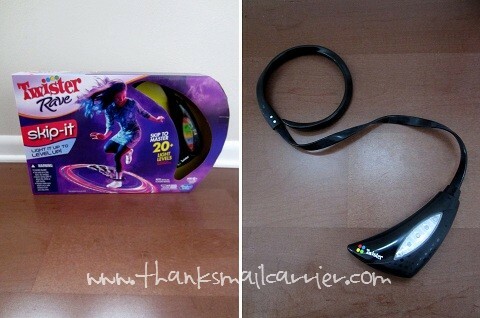 One lucky person will win Twister Rave Skip-It and Twister Rave Ringz from Hasbro! 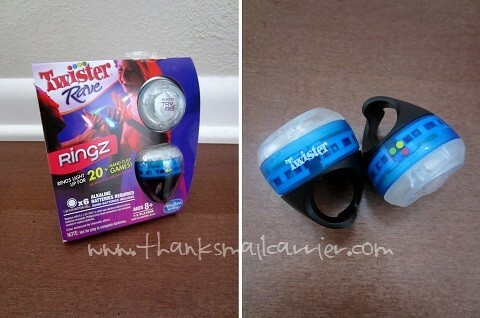 A big thank you to Hasbro for providing Twister Rave Skip-It and Twister Rave Ringz for me to review as well as for one lucky giveaway winner. The opinions shared are my own and honest and if you really need to see more, click here to see how I roll. I loved my hacked game of Monopoly. When I was little, I liked playing Monopoly but nowadays, I really like Sorry. I used to love Monopoly. I always loved playing scrabble. We played a lot of Payday. OH MY GOSH!!! I had a skip it!!!! I always had that thing on! It use to drive my Dad crazy!! Mystery date or clue. I had a skip it too! I never got into Monopoly as a kid, or even adult really. But I did enjoy Life and still do actually! I love Scrabble. We play it every night during dinner. I liked play The Game of Life when I was kid. My favorite board game was different at different times, but I really loved Mall Madness! Guess Who was my favorite! I liked to play Sorry. I loved playing Skip It as a kid! My favorite board game was Hi-Ho-Cherry-O when I was a kid. Monopoly Jr. When I was a kid I loved it. I loved playing Sorry! when I was a kid. Thanks for the chance to win! I loved Chutes and Ladders when I was really little! I loved The Game of Life. I could not get enough of Connect 4 when I was a kid! I always really liked Life! I liked playing uno and still do with my kids. I loved playing Uno as a kid. My favorite board game was and still is Monopoly. Only now, instead of mainly playing it I collect the boards (and play occasionally). I loved to play Aggravation when I was little. I played Risk a lot as a child. I always loved mouse trap. I had a lemon twist! It was very similar to the skip it, but had a lemon on the end. I LOVED that thing and spent HOURS playing with it. I loved playing the card game war! We played the game Trouble a lot in my childhood. I loved to play Uno. I loved Candyland and then Scrabble. The Game of Life was and still is my favorite! I love to play card games like Go Boom and Old Maid. Mine was pretty pretty princess when I was a little girl. I like Racko and the Game of Life! candyland was my favorite game and then uno! Kerplunk was my favorite but I definately remember my pink Skip-It.